What Other Technology Sector Thinks That It Has Arrived At Its Destination? The internet, smartphones, app stores, open source software, all have accelerated innovation at a rate that makes Moore’s law look positively pedestrian. What defines digital technology markets is disruptive innovation, the constant challenging of accepted wisdoms and of established practices. Nothing stays still long enough to give stakeholders the luxury of feeling complacent and to fall back on slower moving sustaining innovations. These are the the realities of consumer technology, unless you happen to be in the digital music business, in which case the prevailing attitude is ‘we have reached our destination’, we have identified the model that is our future and we’re sticking with it. That approach worked fine in the old days of innovation, when Consumer Electronics (CE) companies used to spend years hashing out market standards and then competing in a gentlemanly fashion on implementation. That approach brought us VHS, CDs, DVDs Compact Cassettes etc. Everyone got a bite of the cherry and technologies stuck around for decades. Now they stick around for years, at best. So why is the music industry trying to insist on the $9.99 subscription being the new CD, a 20th century approach to standards in the dramatically different 21st century? And more crucially, why is it able to? Consumers adopt technology in highly predictable ways. First come the early adopters, the tech aficionados who are always the first to try out new apps, services and devices, next come the early followers who supercharge growth, then the mainstream who bring scale of adoption and finally the laggards who adopt at a more measured pace and slow growth. The result is an ‘S-Curve’ of adoption, with slow growth followed by fast growth, followed by slow growth again at the top of the curve. 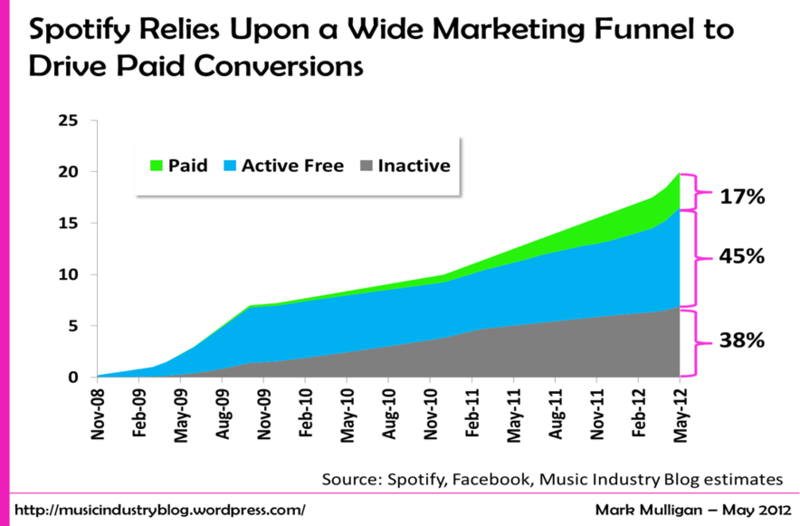 Music services are no exception, usually starting slowly before accelerating and then slowing again when they have saturated their addressable audience. Exactly where growth peaks varies by service and is determined by the type of service, but the same shape of adoption curve plays out nonetheless, most of the time. 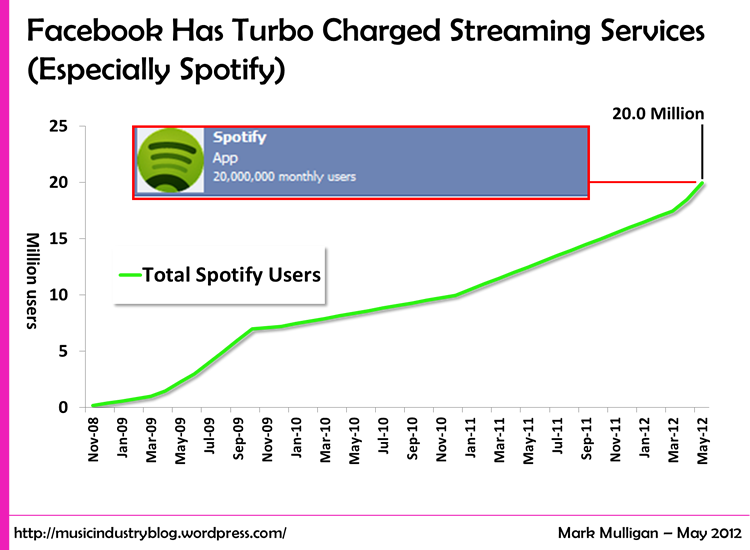 Spotify yesterday announced it had it 30 million paying subscribers. A true digital music landmark. But in the context of its long term growth curve it looks like it might be the start of the end of rapid growth. (It is worth noting that the accelerated growth of the last 16 months has been supercharged by the $1-for-3-months promos so the maturation point may have otherwise been reached earlier or it may have happened at the same time but with a lower number). This isn’t however, some failing of Spotify, rather an illustration that the $9.99 stand alone subscription model is nearing maturity. And this is where the scarcity of innovation comes into play. The major record labels, some more than others, have become increasingly unwilling to threaten the $9.99 status quo. Services that don’t fit the mould either find it impossible to get licenses for new models or they are forced to adhere to the $9.99 cookie cutter subscription model (Soundcloud anyone?). Compare and contrast with the streaming video subscription market. Alongside the mainstream Netlfix, Amazon and Hulu Plus services (the Spotify and Deezer equivalents) there is a growing body of targeted niche services with diverse pricing. These include: Hayu (a reality TV, $5.99), MUBI (cult movies, $4.99), Disney Life (Disney shows and movies, £9.99), Twitch (live streamed gaming, $4.99), YouTube Red (YouTuber originals, $10), Vessel (short form originals, $3) Comic-Con HQ (Comic Con content, pricing tbd). Of course music is drastically different from TV and it is far easier to have a video service with just one slice of all available content than it is for music. Nonetheless, in the video sector there is no prevailing attitude of not wanting to disrupt the dominant $7.99 broad catalogue model. TV and video industry stakeholders are not only willing to tolerate disruptive innovation (online at least! ), they understand it is crucial to drive the market forwards. So why don’t labels take a similar view? A key reason is rights concentration. Because three labels account for the majority of music rights, each has de facto veto power. Most companies that are dominant in their markets pursue smaller, sustaining innovations that improve the product but that do not threaten their businesses. So it is fully understandable that major labels have not empowered disruptive innovations that could risk turning their digital businesses upside down. It would be like turkeys voting for Christmas. 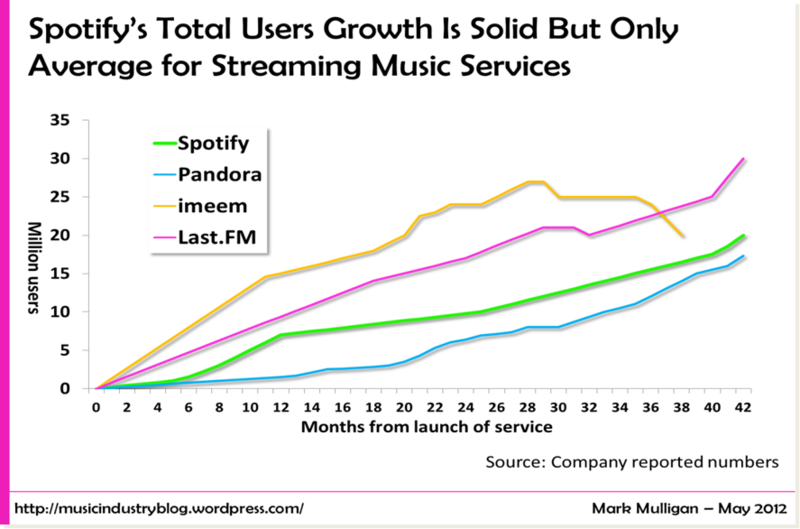 And yet the growth trajectory of most leading music services shows that by sticking with sustaining innovations they are unwittingly curtailing the scale of their future growth. Again, compare and contrast with TV where rights are far more fragmented and are becoming even more so. No single TV network or studio has the ability to stop a service in its tracks. The result is a far greater rate of innovation. Thus music subscription services are forced to behave like the old CE companies, competing on the implementation of fundamentally the same product. TIDAL do exclusives and high definition, Spotify do playlist innovation and video, Apple does curation and exclusives. But when it comes down to it they are selling the same $9.99, 30 million tracks, on demand, mobile caching product to largely the same group of consumers. But even Apple will eventually reach the saturation for the $9.99 product within its user base. In fact, one reading of Apple’s adoption curve is that it skipped the first stage of slow growth, has had a brief period of mid period strong growth and is now settling down for a long gradual arc of adoption that looks like an amalgamation of the final 2 stages of the S-Curve model. Whatever the path, let’s just hope that long before Apple Music hits maturity, the record labels will have woken up to the need to support an unprecedented phase of experimentation and innovation to identify all the other opportunities for premium music that exist outside of the super fan beachhead. Remember its 2016 not 1986. Apple launches a major refresh to the music experience. (I’ll caveat this first prediction with the disclaimer that Apple make a habit of proving wrong those of us foolish enough to try to second guess them.) With that said, there are many things Apple could do with music in 2010. Whatever they do, they have to do something significant if they are to stay on top of their game. They’ve spent much of 2009 collecting user data via the Genius app and they’ve acquired some top notch streaming and programming expertise via the Lala acquisition. And of course they’re busy developing with content partners for the forthcoming touch screen note book. Here’s hoping that this will all add up to something like an integrated on-device, connected, interactive and immersive music experience where the cost is bundled into the price of the device (perhaps with the touch screen note book as the flagship device for the offering). Apple wouldn’t be in the game of hiding the cost of music to the consumer (a la Comes With Music) but they may use content subscription bundling as a way to maintain premium price points and differentiation for their devices. MySpace deepens its focus on music. Though MySpace will spend most of 2010 simply ingesting iLike and imeem, the acquisitions form part of a longer term strategy to breathe much needed new life into MySpace’s music role. The new management talent is tasked with pulling MySpace from the brink of becoming a garbled also ran and dragging it by the collar into the 2nd decade of the century. 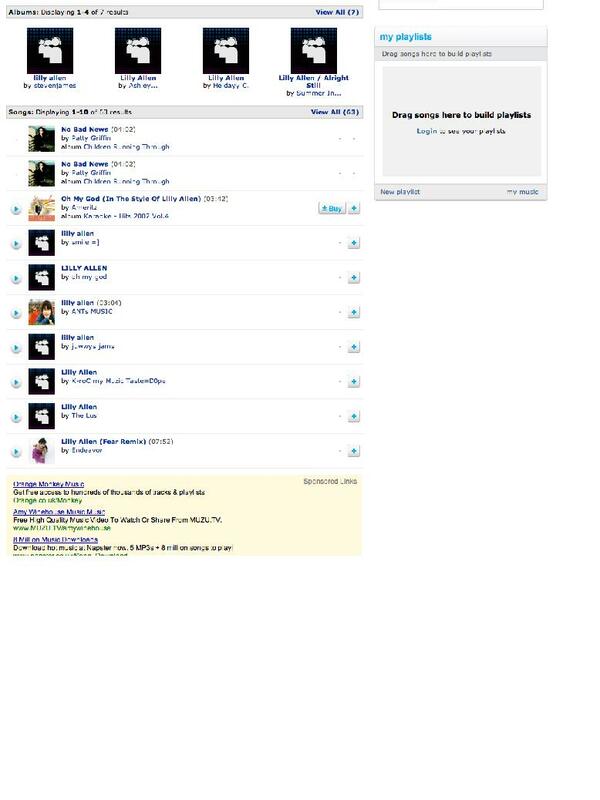 Though they’re unlikely to admit it, the mainstream social networking race against Facebook is as good as over. By contrast they remain the #1 destination for artist communities online, yet without a major reinvention they’ll start to feel the competitive pressure bite there also. Spotify scales back its US launch. Spotify appears to be paying the price for the major labels having second thoughts about ad supported on-demand content. Those pesky US licenses have been proving tough to tie down and I’d expect to see Spotify’s US launch to be more strongly focused on the premium tier than it is in Europe. If so, it could actually prove to be something of a blessing for the Swedish upstart, allowing it to consolidate the monetization of its core user base rather than building a US ad business from scratch whilst millions of free US subscribers add cost to the bottom line. 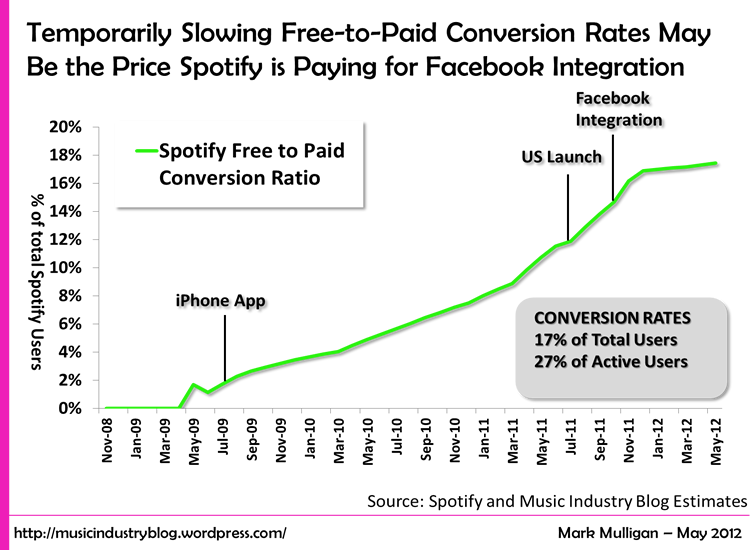 Whatever the case, Spotify’s European revenue fundamentals should improve in Europe in 2010. ISP music services don’t pack a killer punch. I’m a firm believer that ISPs will become established as a core element of the digital music value chain and the best way of fighting piracy head on. In 2010 we’ll see more services launched both in the US and in Europe, especially the UK. But I don’t see anything yet to suggest they’ll be adequately provisioned to flourish. It’ll take another year or two of revenue pain decline for the labels to adjust their license requirements sufficiently. What do I think will work? 5 pounds / euros / dollars a month for household access to near unlimited (i.e. fair use) MP3. Semi–pro sites and services prosper. I’m not sure I’d go as far as to say 2010 will be their year, but it will certainly see continued growth for the likes of SellaBand, MyMajorCompany and Tune Core. These sites that create a route to audiences for artists either not good enough or not yet good enough for record deals, play to the strength of the Internet as a social channel for artists and fans. Which of course is all the more reason for MySpace to be watching its back. To conclude, 2010 will be another year in which digital music continues to find its feet, but significant progress will be made. Why Would Anyone Buy the Pirate Bay? A small Swedish company Global Gaming Factory today announced the acquisition of the Pirate Bay. The acquisition poses far more questions than it does answers. GGF claim that they intend to launch “new business models that allow compensation to the content providers and copyright owners.” This appears to involve some sort of supra-distribution model and GGF are at pains to stress they intend to compensate copyright owners. Of course it is one thing to argue this and another to do it. Normally in such situations there is a massive gulf between content owners’ valuation of their own content and that of software companies seeking to build business around it. Also why buy a site that is diametrically opposed to copyright if you want to build a service which upholds copyright? Napster sold its brand and mailing list to Roxio. As a file sharing network it peaked at over 20 million users, as a subscription service it has less than 5% of that. And really the new business has nothing to do with the old one, nor its user base. Grokster closed down in 2005 following legal action, stating that it would be back ‘soon’ with a legal alternative. We’re still waiting. iMesh re-launched, again after legal action, as a licensed service, with modest success. Kazaa owners Sharman Networks settled with the music industry $100 million including provisions for launching a legal music service, which we still haven’t seen any sight of. The trend is clear, and in many ways it is important that the message is clear that you do not get to the content licensing table by building an audience with unlicensed content. (Though to be fair imeem did push the boundaries). If they do get licenses for some other form of music service they’re unlikely to be able to monetize that successfully with advertising given the current malaise that ad supported content finds itself in. Not to mention the fact that Pirate Bay users are not the most attractive audience for many advertisers. If they intend to charge they’ll have a minimal conversion ratio: Pirate Bay users are there for finding free content, plain and simple. GGF’s CEO is doing this as a philanthropic act because he believes in the cause. Though he asserts that he sees this as a viable business proposition. Pirate Bay has other (cash?) assets that were not revealed in the court case. The experience of Sharman Networks shows us that owners of file sharing properties tend to have incredibly opaque and convoluted business structure to obscure accountability and ownership. I have no evidence that this is the case with Pirate Bay, instead I’m simply making the case that this has happened before elsewhere. The last, and probably the most likely, option is that GGF will launch an adware business, building a client that tracks users’ behaviour and serves up ads based on context and behaviour, typically superimposed on publishers’ inventory. This pretty much the Kazaa model. The fact GGF have additionally bought a peer-to-peer technology company Peerilism points to this also, as does their current internet café ad business model. The big issue here is around whether the application will run on other networks or a proprietary one. If it is the former they simply won’t be able to meet content owners’ requirements and if it is the latter, do they really intend to block out all non-licensed content. Returning to where I started, this acquisition leaves a lot more questions than it does answers. The only thing that is clear is that the Pirate Bay owners, despite claiming to be modern day Robin Hoods have now become multi-millionaires, making them more like the rich Sheriff of Nottingham than the swashbuckling archer. It shifts the consumer focus onto downloads: each card has a pre-stored value for MP3 downloads as the headline. Unlimited streaming is the sub head. This is an innovative move by Napster, and should widen their market appeal, but I can’t help but feel that it is almost embarrassed of its core value proposition (on demand streaming). Positioning the streaming component as a freebie with MP3 tracks will weaken perceived value. They’ll need to be careful with their positioning, or risk further weakening their ability to sell their core product, unless of course they can fire the silver bullet of unlimited MP3s.